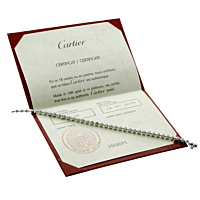 A chic authentic Cartier beaded design diamond white gold tennis bracelet featuring 2.04 carats of the finest Cartier VS quality round brilliant cut diamonds set in 18k white gold. This diamond white gold tennis bracelet by Cartier impresses in its simplicity and is memorable for its subtle yet powerful impression whenever it is worn. The Cartier diamond white gold tennis bracelet brings a beautiful new dimension to the wardrobe of every woman who owns it.